I've had this project in mind for a while, and finally got around to it. I wanted a way to turn on or off the various speakers around the house. In addition to the front room, where the main stereo is, we have speakers in the dining room, hot tub area, and back patio. Previously, I could turn on the amp, pick a playlist from Kodi, and make it play all from my phone, but if I was outside on the patio, I had to go back in the house and push a button to turn on the speakers. No more! 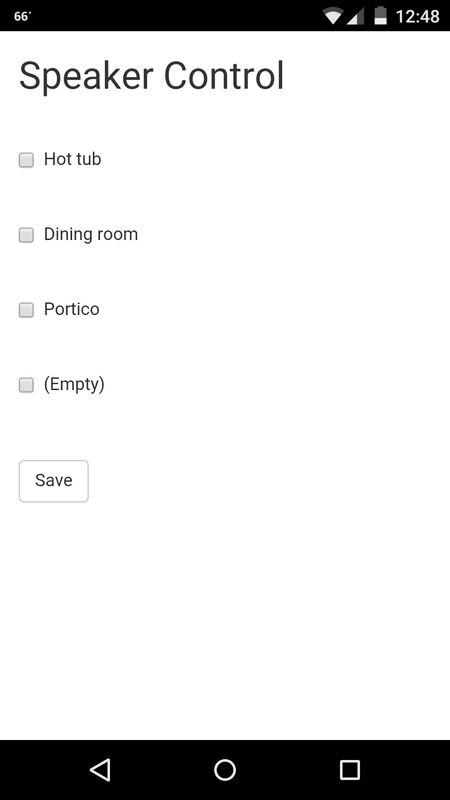 Now I have a simple web app and an Arduino controller to turn on the speakers. 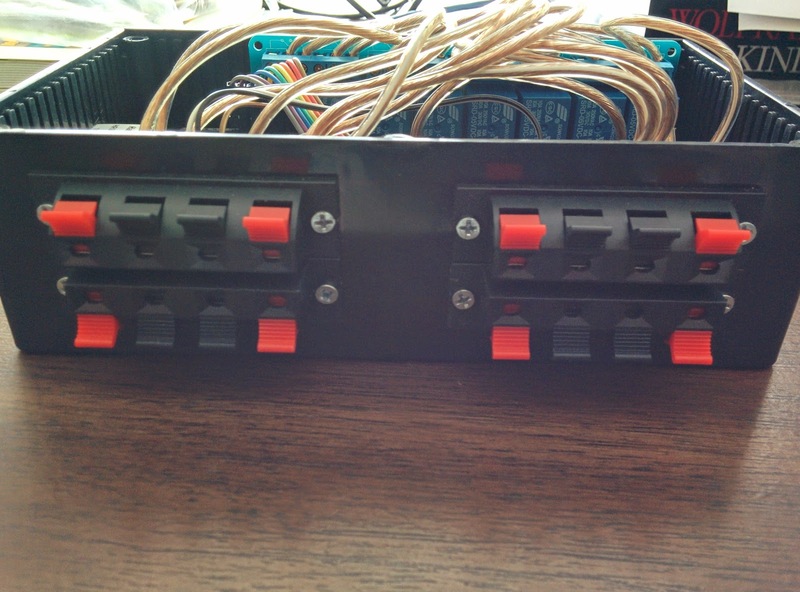 Here is the wiring to control the relay board. The brown wire on the left connects to the 9V output on the Arduino to power the relays themselves. The black wire on the right is the ground, and is common to the board and the relays. The white wire connects to the 5V output on the Arduino to power the relay circuit board. A close up of the connections on the relay board. 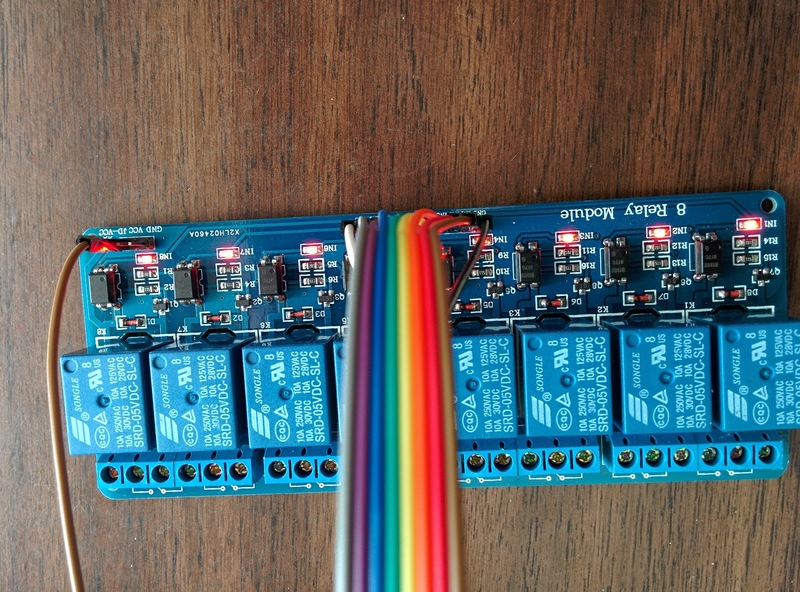 Again, the brown wire on the right is connected to the 9V output on the Arduino and powers the relays themselves, while the white wire is connected to the 5V output on the Arduino to power the relay circuit board. The other wires are connected to pins 2 through 9 on the Arduino to actually trigger the relays. 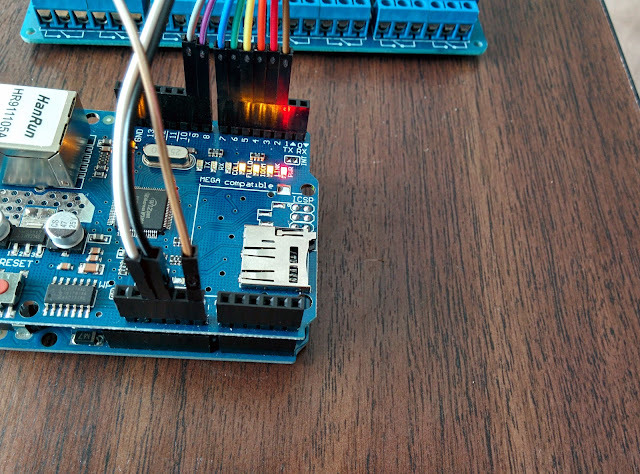 Here are the connections on the Arduino side. You can see the 5V white wire, the black ground wire, and the 9V brown wire. The other wires are connected to pins 2 though 9 to control the 8 relays. A shot of everything in the box. My dremel skills aren't the best, but this will be in a cabinet and essentially hidden from view, so it's okay. There are cut outs for the ethernet, USB, and power connections. The speakers will connect here. It might have been better if I'd found similar connectors that were all black. For this use, each speaker gets two connectors. The negative wire is cut, then one of the cut ends goes in the top row of connectors and the other cut end connects to the corresponding connector in the bottom row. The relay then completes the circuit. These are installed right to left, so the right most connector is controlled by relay 1, and the left most connector is controlled by relay 8. I did it this way so it would be easier to wire into my stereo cabinet. Note that this piece is one of about 6 that make all the speakers work. A shot of the inside. It looks messy, but it's pretty straightforward. Pretty plain, but it does the right thing. available in case I ever find a need to connect one more pair of speakers. // MAC address can be anything that is unique within the local network. // Some unused IP address on the local network. // extract the query string and check for each of the zone numbers. Great project. Where does the audio from the amp enter the circuit? I see four sets of output connectors, but no input connectors. Also, do you use anything to protect the amp or speakers during switching? Ah, I figured the speaker wiring out. Do you need to use some sort of device to protect the speakers or amp during switching? My name is Oscar, at WIZnet in Korea. 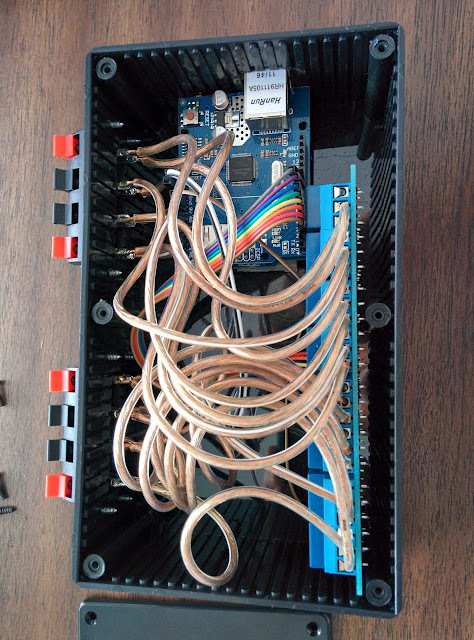 We have been searching some application references in which WIZnet solution is applied, and found your project “Arduino speaker controller“ using Ethernet Shield. In the Ethernet Shield WZnet’s W5100 chip is embedded. Your development looks very cool & smart. It has circuit protection built it. 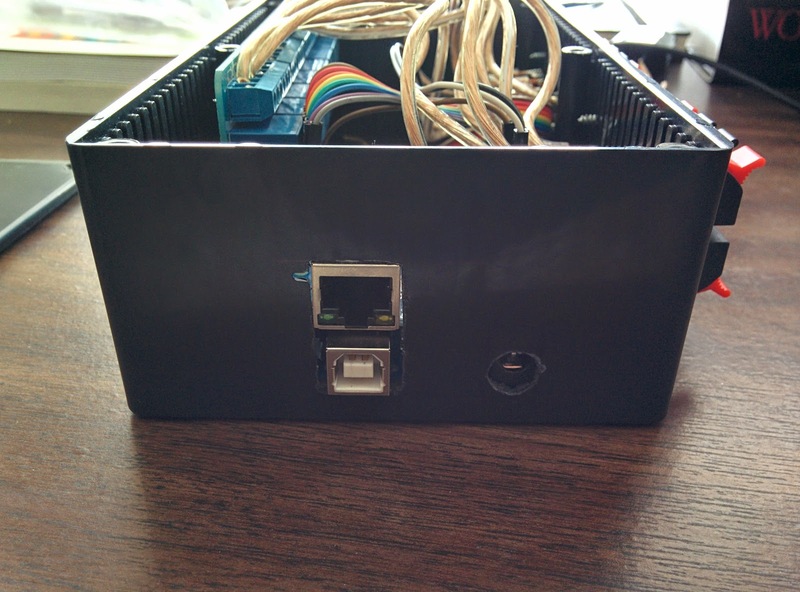 Before I built the arduino box, I had to go push buttons on this box. 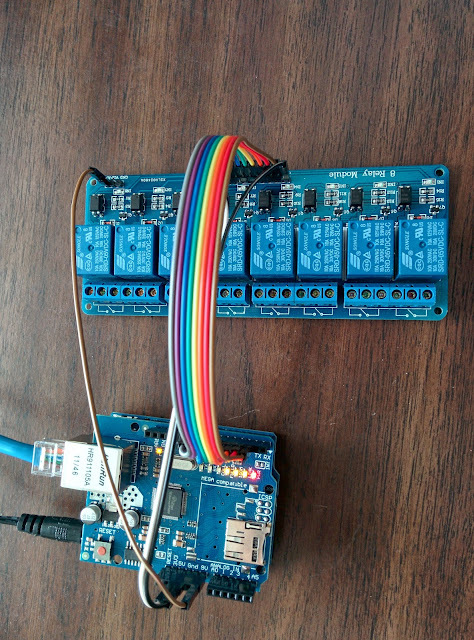 Now I just leave all the buttons on all the time and let the arduino do the switching. 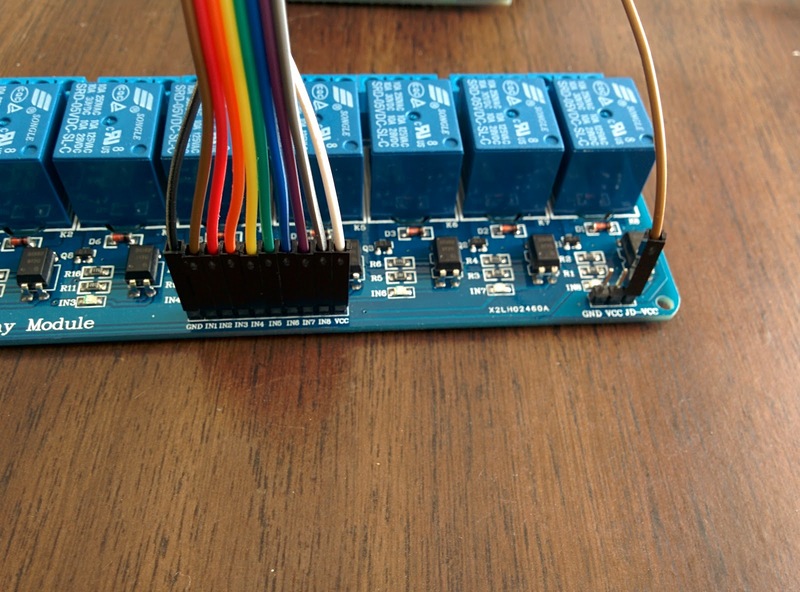 I also have 4 of these downstream (after the arduino) to adjust volume on the individual speaker pairs. Oscar, that's fine with me. @Scotty -- What's it worth to you? Drop me a line at danson at grafidog.com if you're serious. Hi, i would like to know where or how do you connect your amplifier to your relay? I understand that the relay output and switch speakers but where is the "common" / main signal carrying the source? How to connect it? One question however: you are using ISS4. Can I use SSVC4 instead of ISS4 as a feeder? I want to use this solution to route L/C/R channels between 2 sets of acoustics so I need to have a feeder with dual input (input 1 will be L/R and input 2 will be C). I suppose SSVC4 uses some kind of more advanced circuitry because it has built-in volume control - but won't this circuitry malfunction when the output is 'blocked' by the relay? I.e. zone X output is set to 'On' at SSVC4 so the SSVC device 'assumes' that load is active but actually there is no load because the relay shuts the chain down - that's what I'm a little bit afraid of. First off, let me say what an amazing project. This is exactly what I was looking for to control my speakers. However I'm trying to modify your code to include up 6 zones but I've run into a roadblock. For whatever reason the relays on pins 10, 11 and 12 are always on and won't turn off. I will be the first to admit I have no idea what I am doing as I'm just starting out on my road to coding so all I did was copy and paste your code and add in Zone 5 and 6. Then I went through adding in what I thought was the relevant additions but those three relays won't turn off. Mike V - sorry for the really late response, maybe you've figured it out by now, but pins 10, 11, and 12 are for the serial interface and don't work like the other pins. 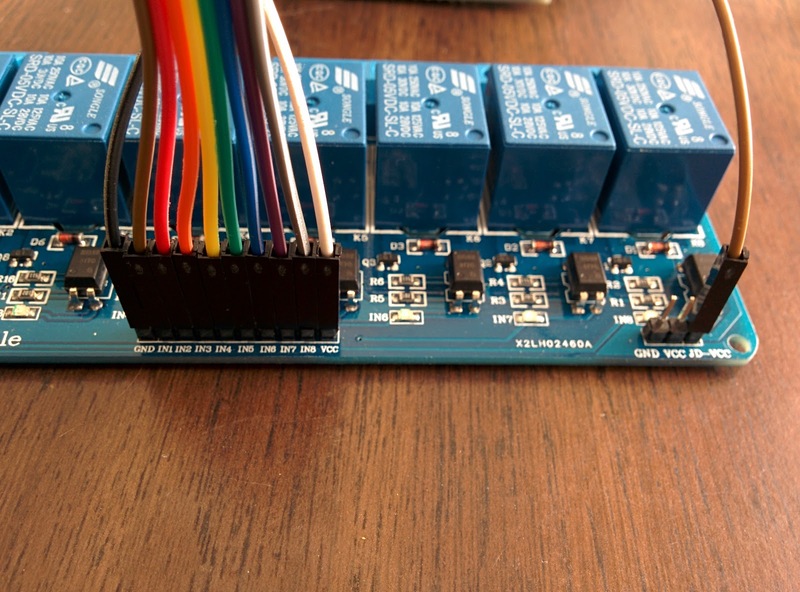 To run more than 4 relays, you'll need a port expander. See the post I did about version 2 for some details. Rodger - I use Kodi to play music, and have the Yatse app on my phone to control Kodi, so I use Kodi via Yatse to control the volume. I've looked into adding volume controls to this speaker controller, but it is somewhat difficult and time is lacking.